Could you be a Silver Infocomm Wellness Ambassador? Going digital is an integral part of our lives today as we build a digital society. More seniors are going digital to expand their knowledge, pursue hobbies and keep in touch with friends and family. 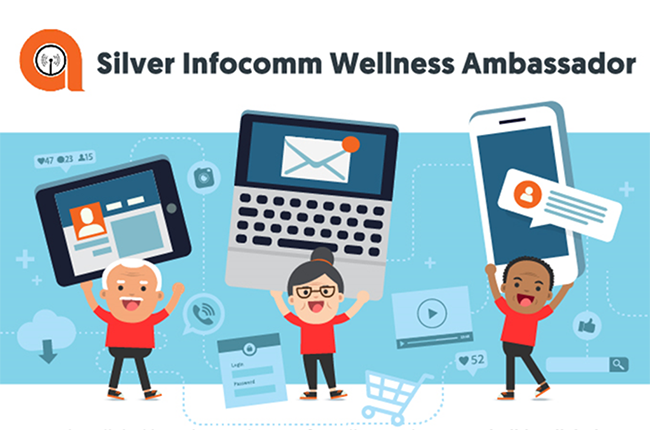 If you are 50 years and above, have embraced a digital lifestyle and have inspired your peers to do the same, we welcome you to be a Silver Infocomm Wellness Ambassador! You may also nominate a friend who has been an inspiration to others. The Silver Infocomm Wellness Ambassador programme is an initiative by the Infocomm Media Development Authority (IMDA) and the People’s Association Active Ageing Council (PA AAC). Nomination closes on 30 April 2018. For enquiries, please call 6377 3800.